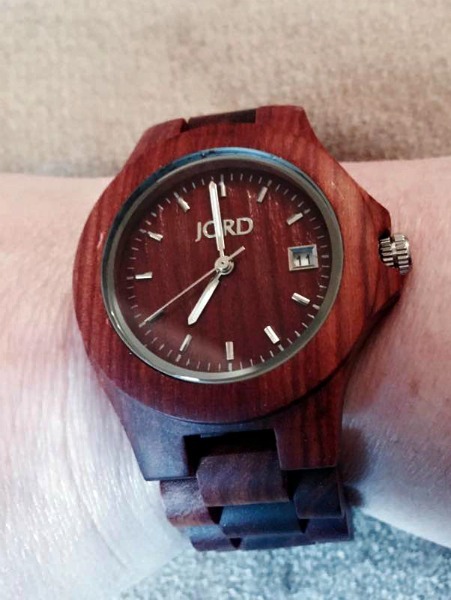 If you read my Ultimate Mothers Day gift guide you may recall that I mentioned the stunning Jord wood watch. I was really lucky to be contacted by Jord all the way from St Louis in the US and was asked to review one of their selection. There are many different options, from big masculine varieties, to small daintier ones, which is what I went for. There are men’s and women’s selections, however, I would actually say that apart from one or two, they are all pretty unisex. So you could have your pick really, depending on your preferred style. I was quite impatient to get my watch but luckily for me, the delivery time is only a couple of weeks from placing the order. 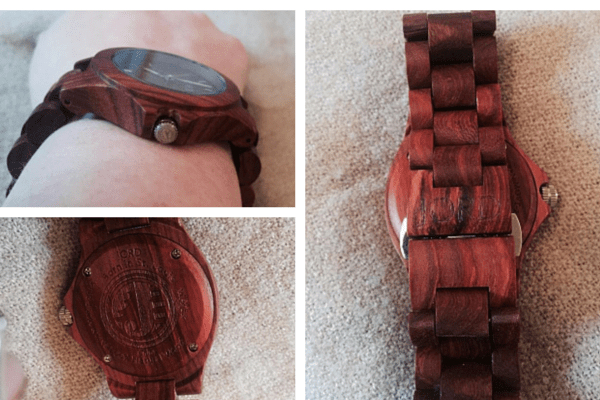 When my wood watch finally arrived safe and sound I was amazed by this beauty nestled in it’s box. There are a few colourways to choose from dark woods right down to the palest Maple, but I chose this lovely red Cherry as I’m quite pale and I thought it would suit my skin tone better. The watch itself is a little chunkier than I am used to personally but it is also extremely light so isn’t at all cumbersome even on my small wrists. I’m really not sure why but I had envisioned it to be quite heavy so this was a relief to me! The one thing to keep in mind is that the watches come with a standard size strap. So if you have small wrists, like I do, you may need to get it made smaller. The website’s FAQ section says you should be able to remove links with a pin but you may feel more comfortable taking it to a jewelers so you know it’s being done right. You also have the option of purchasing extra links if you have bigger wrists which I think is brilliant! Looking at the watch itself you can see that it truly is a watch made from wood (yeah, I know, it’s right there in the name! ), from the face, to the rear panel, to each individual link. I find it amazing that you can make such a delicate thing out of wood! Obviously there are metal parts but even these are of high quality and the little touches, like the tiny J on the crown (did you know that’s what that turny thing on the side of a watch is called? No? Neither did I!). I was also pleasantly surprised to find that the hands glow in the dark which is a nice touch. Of course watches like these aren’t going to be ten a penny. This Ely model is the cheapest wood watch at $129 (plus $20 shipping) which, when you convert it is approximately £100 (including postage costs) which, okay, isn’t cheap by any stretch of the imagination. But when you think about it, is probably cheaper than many designer watches that you can buy nowadays. The one thing I like though is that your not going to bump into many other people wearing one of these lovely watches in the local village shop! 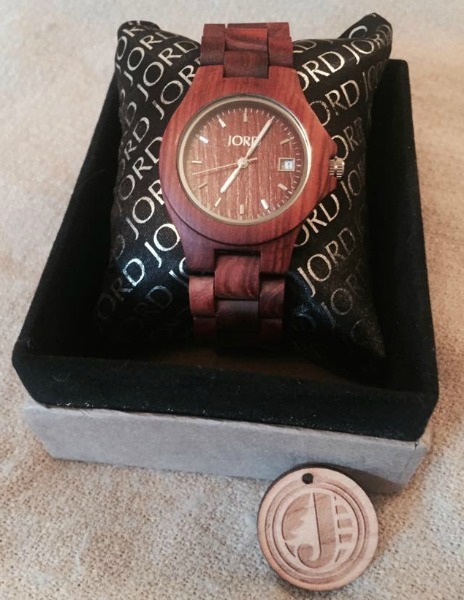 You can see all of the Jord Wood Watches here, which one is your favourite?